Home › Home and Kitchen › Permanent Basket-Style Gold Tone Coffee Filter Designed For Mr. Coffee 10-12 .. 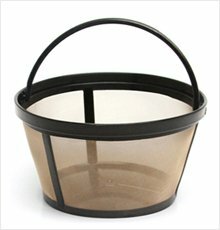 Permanent Basket-Style Gold Tone Coffee Filter Designed For Mr. Coffee 10-12 ..
Reusable golden-mesh coffee filter helps conserve natural resources and protect environment. Generic Basket-style Gold Tone permanent filter is compatible with most Mr Coffee 10-12 cup basket-style coffeemakers. No Retail Box. Item Package Quantity: 1 | Size: 4 Generic Basket-style gold tone permanent filter is compatible with most MrCoffee 10-12 cup basket-style coffeemakers. No Retail Box.